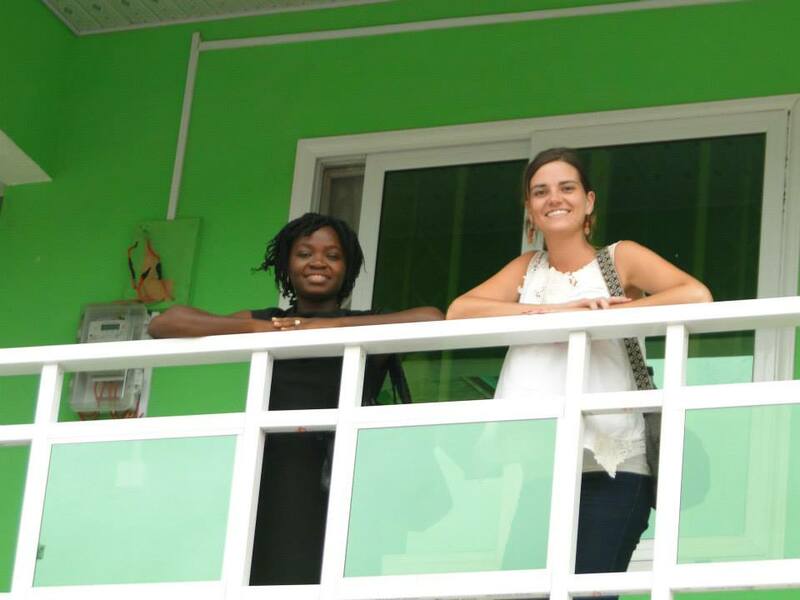 Point Hope Ghana staff with Gillian, a volunteer from Oregon, in front of the Volunteer House. Grilled tilapia, Jollof Rice, and salad (which you should only eat from a place the PHG staff recommends). During your stay in Ghana, you will lodge at the Point Hope Volunteer Guesthouse located in Ofaakor, near Kasoa, about 35 KM west of the capital, Accra. The house can accommodate up to 15 volunteers at any given time and a housekeeper will be on site to provide breakfast and dinner daily. There are many lunch options available near your worksite or you can carry food along. Common snacks include fresh fruit, grilled plantain with groundnuts, grilled corn on the cob, fried rice with chicken or fish and waakye /watch-ee/, which is rice and beans. The cuisine in Ghana is simple and delicious. The best known Ghanaian staples are banku and fufu, which are made from starchy ingredients such as cassava root, yam, plantain, flour, corn or rice. These starchy dishes are generally served with different types of chicken, beef, fish or vegetable stews. Red-Red (fried plantains with beans), grilled tilapia, Jollof Rice (similar to Jambalaya or Spanish Rice), kontombrie stew (coco yam or spinach leaves), groundnut (peanut) soup and okra stew are common. Ghanaians are famous for their spicy "pepe" or "shito" sauce made of tomato, red pepper, onion and garlic and served as an accompaniment to most dishes. Vegetarian diets can be accommodated with advance notice. Laurel, Ryan and Delilah arrived together at Kotoka International Airport. Volunteer Coordinator Ida Boateng-Asare welcomes and provides orientation at the PHG Office. Upon arrival at the Kotoka International (Accra airport), volunteers will be met by a Point Hope staff member and taken to their accommodations. Arriving over the weekend is a good option, as it allows time to adjust before beginning orientation and project work on Monday morning. Volunteers can start any day of the year and can choose from assignments lasting 1 to 24 weeks. At your departure, a Point Hope staff member will take you back to the airport or will help you make arrangements, whichever is appropriate for your situation. 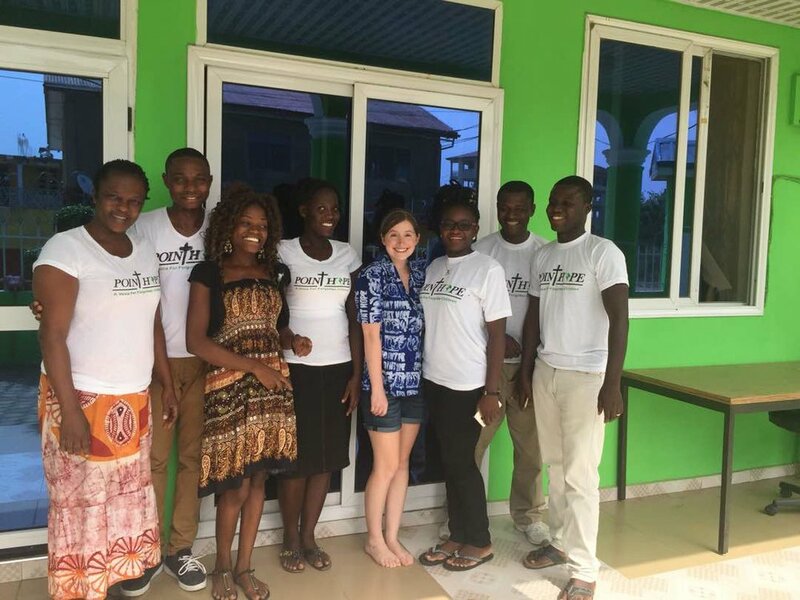 During the first few days in Ghana, Point Hope staff will help volunteers set their bearings after catching up from jet lag. Volunteers will received a full orientation on Point Hope, the history, goals, and varying projects. Staff members will also provide an orientation to your new town or worksite and can help you identify useful resources such as the bank, post office, internet café, lunch spots, taxi or tro-tro stations, etc. Airport pick-up and drop off, orientation, Point Hope t-shirt, program supervision, accommodation and meals during volunteer program period, pre-arrival and in-country 24/7 volunteer support and administrative costs. Visa, flights, travel insurance (mandatory), vaccinations, in-country trips or tours and spending money (volunteers in Ghana generally find $30 USD to be sufficient for basic weekly expenses).